Natural disasters such as the EF4 tornado that flattened a large part of Joplin, Mo., have North Texans thinking about making preparations. Would you know what to if a tornado struck your home or would you be making life and death decision with little or no preparation? Only 7 percent of Americans have any sort of disaster plan in place. But natural disasters such as the EF4 tornado that flattened a large part of Joplin, Mo., have North Texans thinking about making preparations. Tornado shelters such as the one Glenda Mata installed on her Van Alstyne property run into the thousands of dollars. She and her family have taken shelter inside the $10,000 structure three times this year during severe storms. Simply making a plan and sticking to it can save lives during a tornado. "I feel like we've already gotten our money's worth out of it," she said. But the American Red Cross says that being disaster-ready doesn't have to be expensive. "The biggest mistake people make is are not having a plan to start with," Red Cross spokeswoman Anita Foster said. 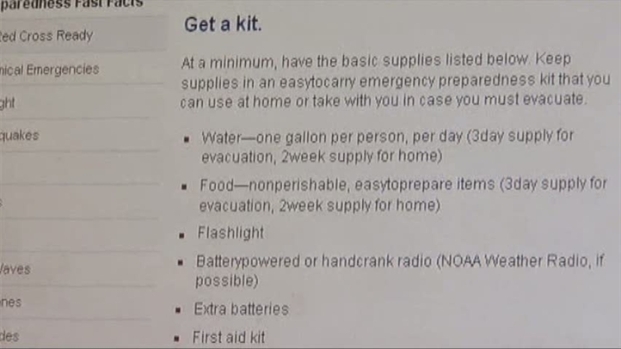 Every basic emergency kit should include a little food and water, a flashlight with batteries and a weather radio. "You can grow your kit from there, but you definitely want to have a way to communicate with the outside world and know what's going on," Foster said. Is the safe room in your house big enough for your entire family? Educate babysitters/caregivers on your emergency plan so you know your loved ones are taken care of if disaster strikes while you're away. If a tornado touches down near your child's school or day care, do not attempt to get to them until the severe weather threat has passed. Check with your employer about an emergency preparedness plan. If one doesn't exist, help create it. For more ideas and to download an emergency preparedness brochure, click here.